In 2005, I read Richard Register’s Ecocities in my community development class and just a few months later began as a student intern. The world has made much progress with the Sustainable Development Goals and Paris Agreement, but the contradictions of center and periphery, technology and nature, capital and labour, local wisdom and global knowledge, persist. 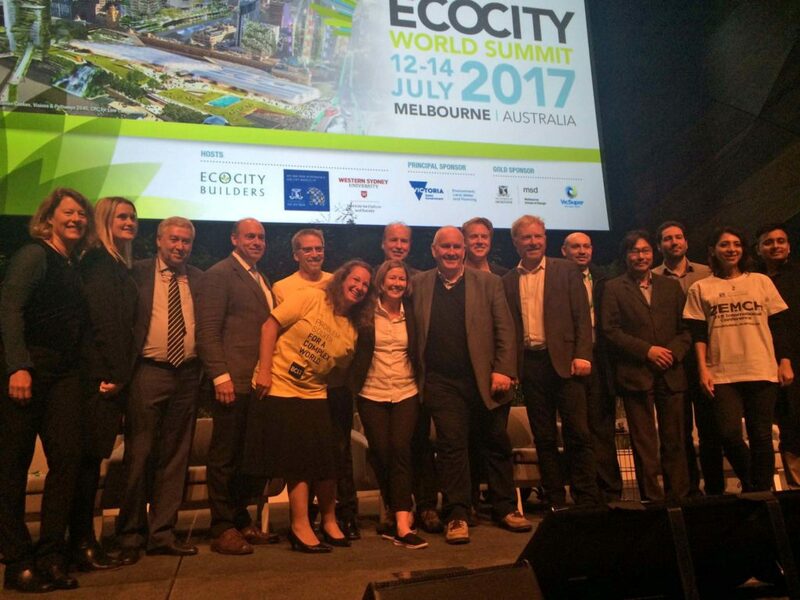 This year, at the 2017 Ecocity World Summit in Melbourne Australia, Richard took time to go over the history of the summit series and how it evolved. He showed photos of each Summit combined with pictures of his drawings: keyhole plazas, vertical dwellings connected by open skywalks, outdoor music and cafes, cars growing carrots. With each successive Ecocity World summit, the scope and ambition evolves. 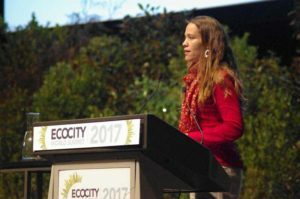 The first Ecocity Summit held in Berkeley California, and coincided with the first “Earth Week”. It was like a set of folk songs by Country Joe and the Fish or a lyric poem. Participants at the Yoff, Senegal Summit stayed with families and danced together. By the time we made it to San Francisco in 2008, where I served on the host committee, we had grown to the level of an experimental opera fit for the Masonic Temple and Grace Cathedral. In Melbourne, we have reached the era where eco-cities are an epic poem, perhaps even their own hit TV series. 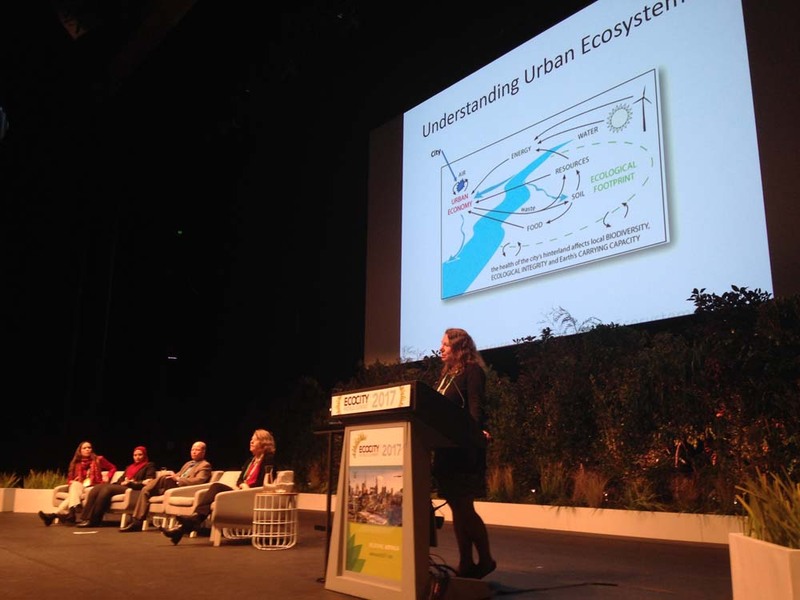 Presentations represented a shift in the complexity, the saturation, the imperative that actors at all levels must face building cities in balance with nature. Al Gore giving the keynote at Ecocity 2017. This conference had several big reveals. Our hosts in Melbourne strategically planned the World Ecocity Summit to dovetail off The C40 Cities Climate Leadership conference. 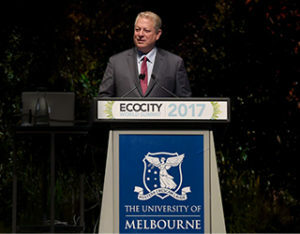 Al Gore spoke at each conference, premiered his new movie, The Inconvenient Sequel, and also got an honorary doctorate from Melbourne University. Obviously, Al Gore receiving another honorary degree will probably not change the world. However, his participation in an international advocacy movement led to formal announcements that could be impactful. First, Tesla Asia-Pacific announced that they will build the world’s largest battery in Adelaide, South Australia. This will be used to balance the electric grid for use with wind and solar. 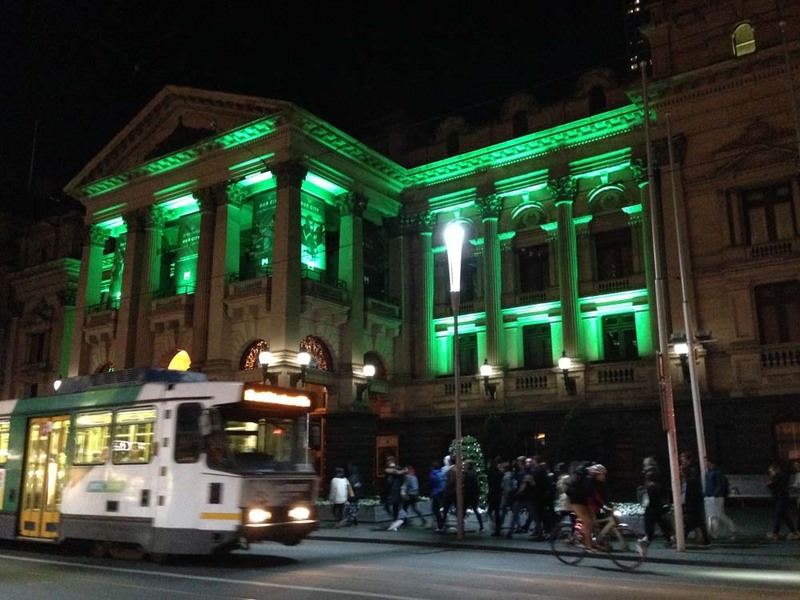 In the second big reveal, Melbourne transit has pledged to go 100% solar to operate its tram system, the largest in the world. Of course, it’s not the largest subway system, and probably not the largest bus system, and it certainly not the largest freeway system. But it is a bold step. Victoria, the state that contains in Melbourne, the Seventh City of the British Empire, also pledged to have 25% clean energy by 2020 and 40% by 2025. Al Gore highlighted these commitments in his keynote address as positive steps to address climate change that has been devastating coastal cities and small island states. Rather than go through each day of the conference, I would like to touch on four themes that I took from the conference: 1) the central role of indigenous wisdom, 2) paying attention to health and well-being in face of gentrification and disasters; 3) interrogating contradictions of capital and community, and 4) using big data for small neighborhoods. Indigenous music performance at the welcoming reception. Public events in Australia begin with Welcome to Country. 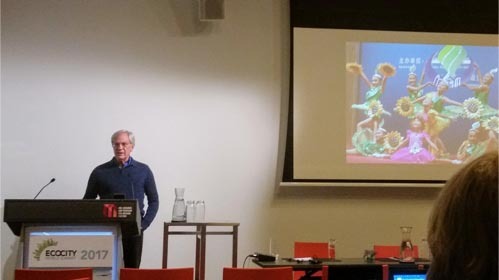 Mr. Ruben Berg, a local architect and expert in sustainable building materials, gave the Welcome to Country. He let us know that Aboriginal Australians have been on the continent for 60,000 years. If people have been able to survive for 60,000 years, that meets the definition of sustainable living. But will we be able to live for another 60,000 years? He acknowledged his mother and grandmother, who passed on to him the proper way to Welcome to Country in his own indigenous language. Amelia Telford, co-director of the SEED Indigenous Youth Climate Network thanked Ruben for his Welcome to Country and acknowledged with some regret that she did not know her people’s language. But she did know how to organize. Their current campaign is “land rights not mining rights”. SEED is also working to stop fracking in the Northern Territory and Queensland. She thanked New South Wales for banning tracking. For Miss Telford, her environmental activism as a direct expression of her identity as an aboriginal Australian to protect country. It is a commitment to her children that she will work to make sure that they have country to pass down to their children. On Wednesday morning, we were also honored by remarks from HE Mr. Yogesh Punja, Fijian High Commissioner to Australia. Fiji is convening the United Nations Framework Convention on Climate Change (COP23) in Bonn, Germany this Fall. The importance of cutting carbon emissions is known to small island nations. All eco-cities are local. In the face of national gridlock, local solutions emerge. Imagine if you will Prime Minister Malcom Turnbull leading a coalition government of the Liberal Party (i.e., liberal as in free markets) and conservatives (i.e., faith, security, and family) with a one seat majority. He replaced Tony Abbot, a sharp critic of carbon taxes, after only serving two years. Australian energy policy at the Federal level has been at a stalemate. Queensland’s economy is tied heavily to coal and mining and has been able to use its weight to prevent a national policy that is unfriendly to coal. Labour controls South Australia and Victoria. These states are able to take action on a clean energy renewable portfolio as well as the cities in these states. For example, regional cities in Australia such as Geelong, an industrial city about two hours southwest of Melbourne, shared how they were thinking strategically about economic development as manufacturing jobs were in decline. They shared how they could leverage transit linkages to Melbourne as well as improve local access by making streets more bike friendly and pedestrian friendly in key downtown areas. Other cities like Renwick shared their way to finance energy and water reductions with a 6% environmental levy. In contrast, Amy Aussleker of Envision Charlotte, North Carolina, shared how to finance energy reductions by having a competition among local businesses over who could save more money. Teresa Williamson of Catalytic Communities in Rio de Janeiro shared how NGOs in favelas work with residents to make their neighborhoods sustainable. I first met Theresa at Rio+20 and she took me around Asa Branca to see how the residents built their own sewer system and recycling industries. The key thread here is that there is an embeddedness and critical role that local knowledge plays to determine solutions for sustainability. 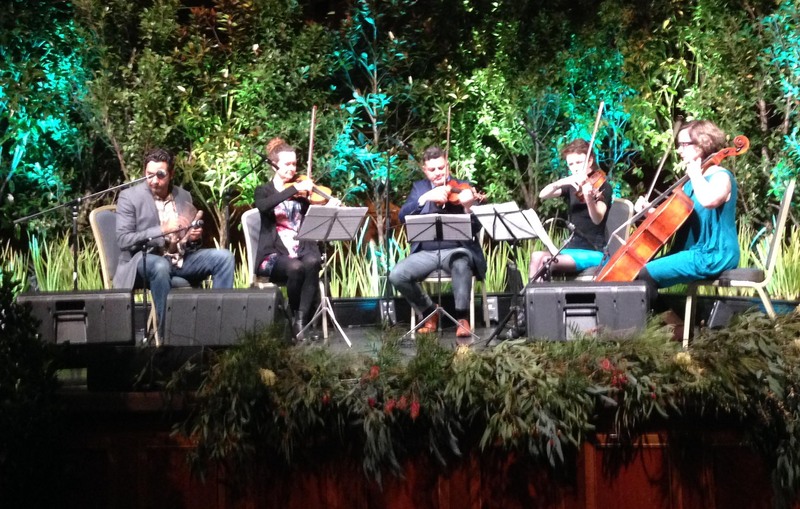 What struck me about the Welcome to Country is how it immediately it evokes a sense of living in balance with nature. Because we are welcoming to “country”, as in countryside or the land, and its custodians. It did not feel like a “welcome to the nation-state” or “Welcome to Australia”: it’s welcome to the very place upon which we stand, the watershed that quenches the soil to hold the plants and animals that sustain us. It’s less a political statement, or mere politeness than reverence and acknowledgment. It takes an intergenerational commitment to people in a place to understand how to live in balance with nature. The author presenting on the impact of gentrification on aging populations in Detroit. Eco-cities should be healthy and caring cities. I have been thinking about how gentrification shapes cities and presented some of our work. Does gentrification make us sick? Or are we just sick of gentrification? Many people age in place and continue to live in the neighborhoods where they lived. Gentrification can put the economically vulnerable at risk of displacement and be a stressor. But it also brings more services through capital investment. Using data from the National Health and Aging Trends Study, my team found economically vulnerable older adults in gentrifying neighborhoods reported higher self-rated health than economically vulnerable older adults in low-income neighborhoods. However, older adults are sick of gentrification. Both economically vulnerable & higher-income older adults in gentrifying neighborhoods reported more distress than those in affluent areas. Higher-income older adults in gentrifying neighborhoods reported more distress than those in low-income neighborhoods. Sometimes access by proximity might come at a cost to quality of life if gentrification is a cause of distress. On the same panel, Maureen Connelly of the British Columbia Institute of Technology presented on sound quality in the eco-city. Noise can lead to sleep disturbances and elevated cortisol levels leading to stress and poor health outcomes. On the other hand, restorative sounds, which might be the sound of flowing water or of people and animals walking through leaves can be promote well-being. The challenge in building a landscape designs is to minimize disruptive noise but also allow opportunities for natural sound in living environments. Professor Syn Chee Mah of the Melbourne School of Design showed ways to change how the sidewalks that connect housing for older adults to the streetscape can be redesigned for better pedestrian access and utilization. Melbourne is preparing for natural disasters, but also economic shifts in industry mix. It has traditionally been the manufacturing center of Australia, serving as the regional headquarters for GM Holden, Toyota, and other automobile manufacturing. I took a tour of Fisherman’s Bend, the industrial neighborhood that has been designated an urban renewal area. Because I live in an industrial city called Detroit Michigan, I expected a very different landscape. Typically, urban renewal areas involve public acquisition of land, displacement, and redevelopment. 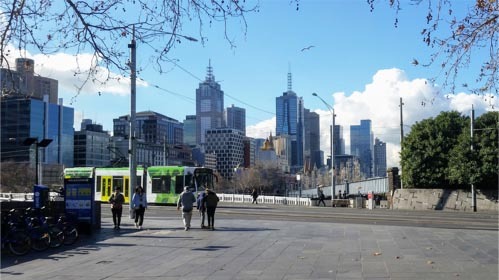 In Melbourne they are doing urban renewal by liberalizing zoning for more residential and retail and making targeted investments in transportation, services and green space. Although Fisherman’s Bend is a short walk to a convention center, it looks like a suburban office park. While there is some existing historic single family housing stock, a small school, recreation center and park, much more would have to be built to ensure the health and well-being of new residents. For starters, a smaller automobile supplier across the street from Toyota has been converted to a cafe and barbershop to serve the planned design center. In a high rise development near the convention center, a school was put on the first floor to anticipate families with children. Since cities are not only a place, but a flow of resources, disaster planning has to carefully consider food access during an emergency. Angharad Wynne Jones of Arts House created a simulation of a 24 hour emergency in Melbourne called the Refuge Project, in partnership with the Red Cross. The audience signs up for a 24 hour ticketed experience of living through a natural disaster. Brush fires are the typical disaster in Australia, but they are also thinking about sea level rise, given that several capital cities are on the coast. Since food stocks typically only last 3 days, people who attend the Refuge Project learn how to do urban foraging and make rat stew. As a vegan committed to sustainability, it taught me that I need to stock more than three days’ worth of lentils in case disaster strikes. Free markets or free garbage? Some conference attendees saw role of markets as a major contributor to climate change and unsustainable living, while others saw markets as a potential solution. For example, I was able to sit in the fourth row for the keynote delivered by Al Gore, a champion of markets. He still has the build of the football player and has come a long way since being ridiculed by Saturday Night Live for being boring. He noted that he had only been in business for about 10 years or so, but with the increase in weather related disasters, it seemed like it would make good business sense to invest in carbon reduction, like Tesla. Indeed, Mark Twidell, Managing Director of Tesla (Asia-Pacific) made clear that Tesla’s mission is to “accelerate the world’s transition to sustainable energy.” In Australia, they offer solar roof shingles, home batteries, as well as the electric cars. On a stroll through the Melbourne laneways. The afternoon plenary, Sustainable and Resilient Cities, that followed Al Gore’s talk provided alternative perspectives on the role of free markets. Professor Paul James of Western Sydney University chaired the plenary. He set the tone recognizing the importance of local control and ecological governance. Professor Harriet Bulkeley of Durham University noted the current fragmentation of authority regarding domains of decarbonization, justice, smart cities, and resilience. She argued that active experimentation is needed to produce the knowledge needed to create eco-cities. Andy Merrifield argued that capitalism is unsustainable and that we need to assert a “Right to the City”, a concept that comes from the work of Lefevre and Harvey. A right to the city is a collective right, enacts a localized citizenship to control the space to common good. This theme was expanded by Professor Katherine Gibson of Western Sydney University. She discussed the importance of “commoning” to sustainability: access, use, benefit, care, responsibility, and ownership. She advocated for the importance of public space and cooperative enterprises. I followed this theme of commoning to a presentation by other scholars at Western Sydney University’s Institute for Culture and Society. Stephen Healy presented work on anchor strategies in the United States. These are ways local governments, universities and hospitals create public private partnerships to localize the economy. Doctoral candidate Jo McNeil presented on how the Great Lakes Community Resources, a profit for purpose organization, has been using “social procurement” to promote cooperative development and local sustainability. They add to their request for proposals a desire to contract with locally owned and operated cooperatives that will provide an adequate level of compensation. One social enterprise launched from this is “Soft Landing”, a mattress recycler with 70 employees run as a non-profit. They have recycled 1.6 million mattress using 90% recycled materials: a “waste to wages” success story. Social enterprises for sustainability have also flourished in Indonesia: Erika M. Duncan Horner, a doctoral candidate at Monash University, explained how community activists with technical know-how and a passion for the environment have developed solutions in absence of government action. These actions contributed to several Sustainable Development Goals (e.g., Economic Development & Employment, Sustainable Production and Consumption, Social Justice). In the 1980s, communities developed mini community sewage systems and cleaned water using fish and micro greens. More recently, in response to the death of a young girl from diarrhea, a local physician came up with a way to finance health insurance by selling garbage for recycling. Shann Turnbull, an independent scholar, argued that if without community ownership, a city could never be sustainable. He encouraged more to use community land trusts to allow recapture of appreciation to allow for self-financing of affordable and sustainable real estate development. This approach has been key in Boston, Massachusetts in the Dudley Street Initiative. One message from the Summit is that capitalism produces garbage. However, what market institutions and regulatory institutions both share is the problem of information asymmetry. Large governments and large business are rational and slow. Both small governments and small businesses can be nimble and experiment in ways to turn garbage to gold. Big data in small neighborhoods? Dr. Jennie Moore discussing urban ecosystems and Ecocity Standards. For 10 years I’ve been working with Ecocity Builders on the problem of measuring progress towards becoming an eco-city. Because of our work, I am part of two Grand Challenges convened by the American Academy of Social Work and Social Welfare: 1) Harnessing Technology for Social Good, as well as 2) Responding to the Changing Environment. Several presentations at the Summit showed how technology can be harnessed for social good and to respond to the changing environment. Kirsten Miller, Executive Director of Ecocity Builders and Jennie Moore, Associate Dean for Building Construction at the British Columbia Institute of Technology, presented the eco-city standards. We passed out a copy of the high-level standards and ask people to rate how they felt their city was performing. Kristen Miller argues that standards can be both universally applicable and locally adaptable. The way I often think of that is that we know categorically that all life depends on water. However, how much water we can use and in what way might vary from bioregion to bioregion. Put simply, we might use less water in a desert, and we might have the luxury of using more water in a rain forest. The Ecocompass training manual shows community members how to do participatory research and visualize natural resource flows using the Urbinsight platform. This is one-way to get data on small neighborhoods. Later in the conference, evolve24, a consulting firm in St. Louis Missouri, has put together a set of tools to analyze social media, such as Twitter feed, and aggregate the sentiments found in the text. They distinguish between sentiment, which includes positive or negative moods, versus emotion, language that implies that the person will take action. Where data are available, they locally target findings. However many people do not geotag their social media feeds for privacy considerations. Neighborlytics, a Melbourne start up, markets a personalized neighborhood platform to review all aspects of neighborhood life. It aggregates the user social media stream makes available to other users. It allows people to see not only formal activities, but also informal organization such as activity at bars, restaurants and concert venues. But it also shows how people might use public space informally. For example it might tell you a good place to walk your dog or what part of the beach to avoid on a particular afternoon. Professor Paul James helped close the conference with his presentation on the Sustainable Development Goals and how he has been visualizing each city’s progress. He presented four legs of the sustainability stool, as principles for better cities: ecology, economics, politics, and culture. He compared Melbourne, the world’s most livable city, to Port Moresby, which ranks the third lowest on the livability index. The paradox is that Port Moresby actually scores higher than Melbourne on several ecological measures. This highlights the tensions inherent in trying to achieve sustainability in the global economy. Consumption oriented economies are not necessarily sustainable and in the long run this will reduce livability. At the same time, inadequate consumption and services do not provide for adequate health and well-being. Part of this problem is the information asymmetry for people to get the information necessary to make sustainable choices and collectively plan for change. Local users need have access to global knowledge. To harness technology for social good we need to move data from the centers of calculation to the periphery of calculation. 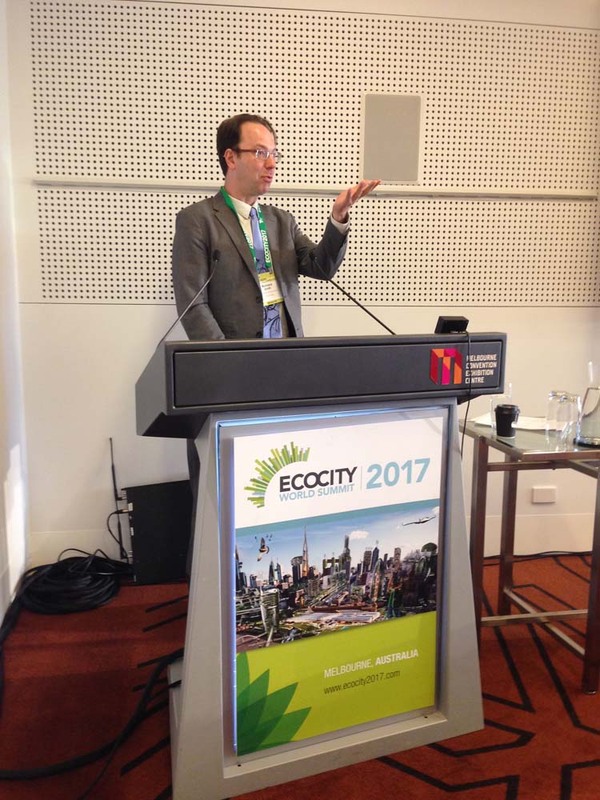 Steve Bercu, the President of Ecocity Builders, formally announced that the next world eco-city Summit in October 2019 will be in Vancouver, British Columbia. Wayne Hand, Dean of the School of Construction and the Environment of The British Columbia Institute of Technology, and Associate Dean Jennie Moore, took up the challenge. Vancouver is unceded territory of the Musqueam, Squamish and Tsleil-Waututh First Nations people and this will be acknowledged. I fully expect William Rees, an ecological economist at the University of British Columbia, to explain the imperative of having a steady state and localized economy for the sustainability of the planet. The conference will be car free—accessible by rail, bus and bike. The convention centre has a six acre green roof and much of the food that we eat will be locally sourced. The main theme of the conference will be eco-city standards. Vancouver will be demonstrating how they not only developed key measures of sustainability, like the ecological footprint, but are also living it. Passing the Ecocity World Summit Baton to Vancouver. Reference: Smith, R. (2017). 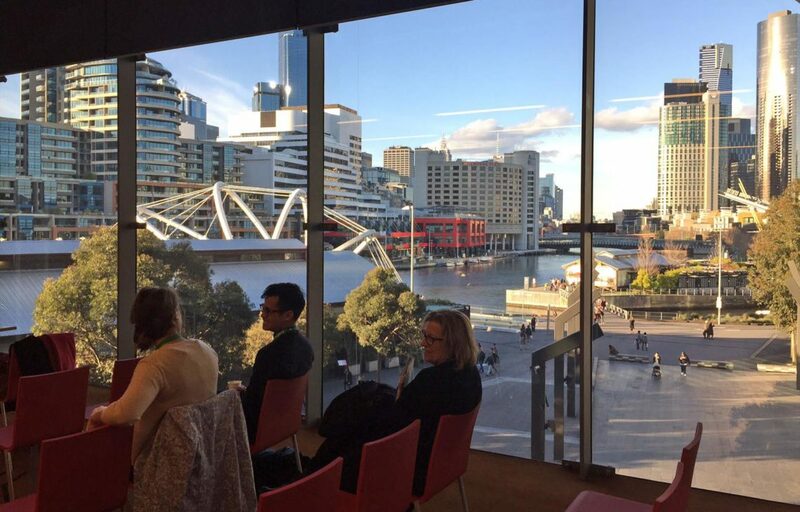 Indigenous wisdom and the peripheries of calculation: reflections on the 2017 Ecocity World Summit in Melbourne, Australia. Reflections Series, Issue 22. University of Westminster. Link (PDF). 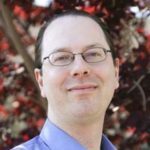 Richard Smith, MFA, MSW, PhD, is an Associate Professor at Wayne State University and Project Associate and researcher for Ecocity Builders.